Hey, Folks! This is Geeky Talks and today we'll be discussing latest BSIV Standard Engine technology and its impact on Indian Bike Market. Let me introduce you with BSIV standard engine technology, BSIV means Bharat Stage IV are some set of rules laid by the Indian Government in order to control emission of harmful gases which are causing pollution. This is just a simple change in Engine technology of bikes in order to control pollution which has become a major task and if not controlled then it may be hazardous to human life and this environment. There's a rule set by the government under which no bikes with BSIII Engine will be sold in the country after 31st March of 2017 even no registration of BSIII bikes is allowed by Regional Transport Office. Since this move is really a good step towards a better future we happily appreciate this act. Recently, one of my friends decided to purchase a new bike from the market. 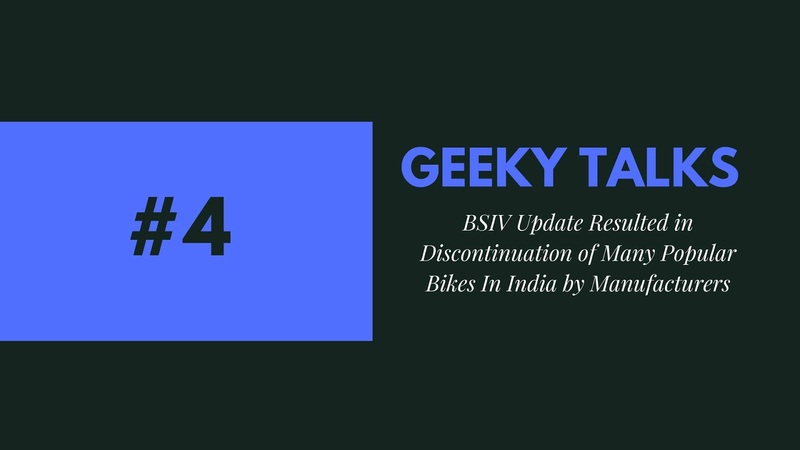 Since only BSIV bikes are only available in the market so we started searching our own researched models from the Internet but all of a sudden when we visited the dealerships then finally came to know that many models from my list have been discontinued by the manufacturer. Although we don't know why company discontinued many popular models from their portfolio. But these bikes will be missed by our enthusiast Indian riders as once these bikes ruled over our Indian roads.